I’m 57 (58 next month) and as my childhood gets further and further away, I miss more and more the things of that time. I think most of us do. To forget out childhood, and our childhood friends, seems like an impossibility. But not to Christopher Robin. 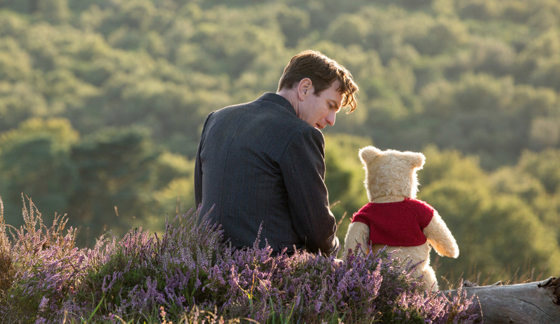 A film that melts your heart in its first five minutes, “Christopher Robin” follows the title character (McGregor) into young adulthood, where he goes off to school, falls in love, goes to war and then settles down to raise a family. Now a working-class family man, Robin’s daily duties include cutting costs at the luggage manufacturing company he works for and ducking his Gin Rummy-crazed next door neighbor. He has long ago put away his drawings from childhood, where he and his friends would have adventures. His latest adventure – breaking his promise to his daughter and sending she and her mother off on holiday alone. Another weekend working. Oh, bother. 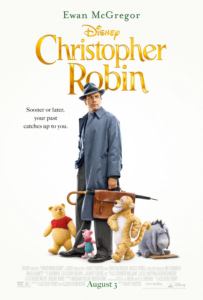 A perfect blend of live action and CGI, “Christopher Robin” brings back to life such cherished characters as Tigger (also voiced by Cummings), Eyore (Brad Garrett), Piglet (Nick Mohammed), Rabbit (Peter Capaldi) and Owl (Toby Jones). Along with Pooh, they do their best to convince a dubious Christopher that you can’t lose the past if you don’t want to. “Did you let me go,” Pooh asks softly. Christopher can only ponder the question. McGregor is perfectly cast as a young husband and father, trying to provide for his family and not realizing that, the more he tries, the further they are drifting apart. Atwell is just as strong as Christopher’s wife, Evelyn, and young Bronte Carmichael is sadly sweet as their daughter, Madeline. The special effects are flawless and, if you’re not too careful, you too might find yourself talking to stuffed bears and planning age-old adventures.